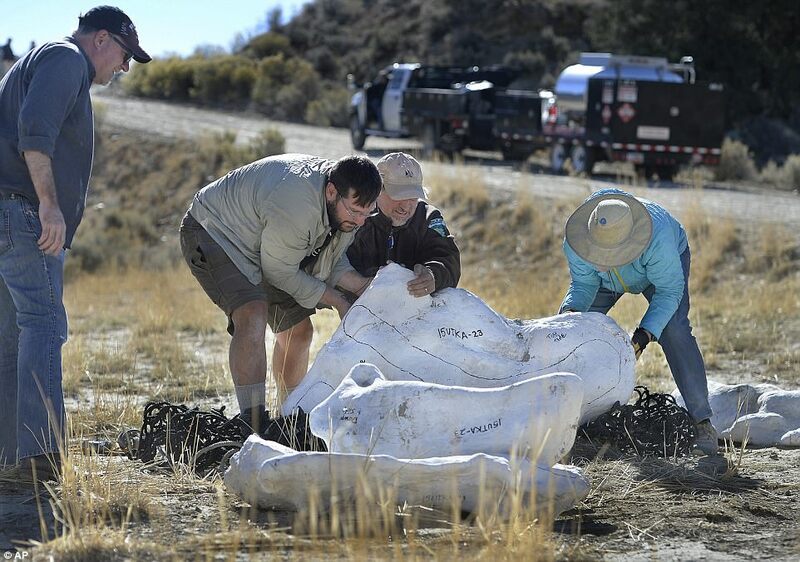 A remarkable new fossilized skeleton of a tyrannosaur discovered in the Bureau of Land Management’s Grand Staircase-Escalante National Monument (GSENM) in southern Utah was airlifted by helicopter Sunday, Oct 15, from a remote field site, and delivered to the Natural History Museum of Utah where it will be uncovered, prepared, and studied. The fossil is approximately 76 million years old and is most likely an individual of the species Teratophoneus curriei, one of Utah’s ferocious tyrannosaurs that walked western North America between 66 and 90 million years ago during the Late Cretaceous Period. GSENM Paleontologist Dr. Alan Titus discovered the fossil in July 2015 in the Kaiparowits Formation, part of the central plateau region of the monument. Particularly notable is that the fossil includes a nearly complete skull. Scientists hypothesize that this tyrannosaur was buried either in a river channel or by a flooding event on the floodplain, keeping the skeleton intact. “The monument is a complex mix of topography–from high desert to badlands–and most of the surface area is exposed rock, making it rich grounds for new discoveries, said Titus. “And we’re not just finding dinosaurs, but also crocodiles, turtles, mammals, amphibians, fish, invertebrates, and plant fossils–remains of a unique ecosystem not found anywhere else in the world,” said Titus. Although many tyrannosaur fossils have been found over the last one hundred years in the northern Great Plains region of the northern US and Canada, until relatively recently, little was known about them in the southern US. This discovery, and the resulting research, will continue to cement the monument as a key place for understanding the group’s southern history, which appears to have followed a different path than that of their northern counterparts. This southern tyrannosaur fossil is thought to be a sub-adult individual, 12-15 years old, 17-20 feet long, and with a relatively short head, unlike the typically longer-snouted look of northern tyrannosaurs. Collecting such fossils from the monument can be unusually challenging. “Many areas are so remote that often we need to have supplies dropped in and the crew hikes in,” said Irmis. For this particular field site, Museum and monument crews back-packed in, carrying all of the supplies they needed to excavate the fossil, such as plaster, water and tools to work at the site for several weeks. The crews conducted a three-week excavation in early May 2017, and continued work during the past two weeks until the specimen was ready to be airlifted out. Irmis said with the help of dedicated volunteers, it took approximately 2,000-3,000 people hours to excavate the site and estimates at least 10,000 hours of work remain to prepare the specimen for research. “Without our volunteer team members, we wouldn’t be able to accomplish this work. We absolutely rely on them throughout the entire process,” said Irmis. 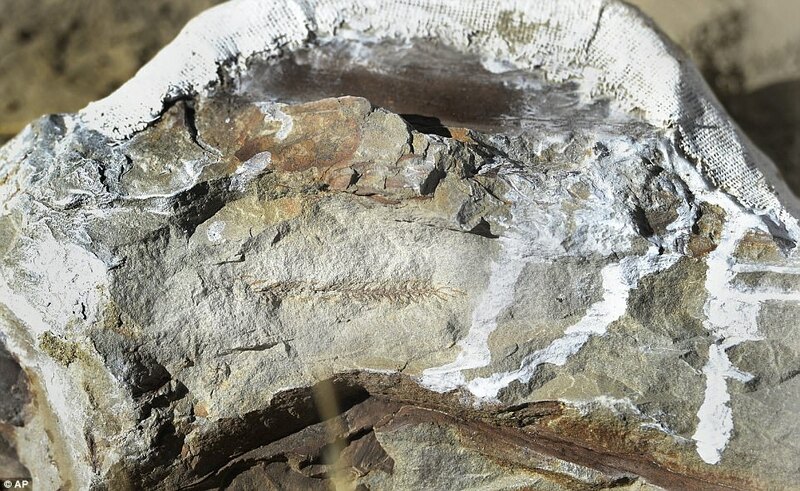 Irmis says that this new fossil find is extremely significant. Whether it is a new species or an individual of Teratophoneus, the new research will provide important context as to how this animal lived. “We’ll look at the size of this new fossil, it’s growth pattern, biology, reconstruct muscles to see how the animal moved, how fast could it run, and how it fed with its jaws. The possibilities are endless and exciting,” said Irmis. Find more photos and videos from the airlift here. Fieldwork was conducted under permits issued by the Bureau of Land Management. Funding was provided by the BLM National Conservation Lands Scientific Studies Support Program, Grand Staircase-Escalante National Monument, and University of Utah.